When policymakers change the money supply or the level of taxes, they shift the aggregate-demand curve in directly by influencing the spending decisions of firms or households. By contrast, when the government alters its own purchases of goods and services, it shifts the aggregate-demand curve directly. Suppose, for instance, that the U.S. Department of Defense places a $20 billion order for new fighter planes with Being, the large aircraft manufacturer. This order raises the demand for the output produced by Boeing, which induces the company to hire workers and increase production. Because Boeing is part of the economy, the increase in the demand for Boeing planes means an increase in the total quantity of goods and services demanded at each price level. As a result, the aggregate-demand curve shifts to the right. By how much does this $20 billion order from the government shift the aggregate-demand curve? At first, one might guess that the aggregate-demand curve shifts to the right by exactly $20 billion. It turns out, how ever, that this is not the case. 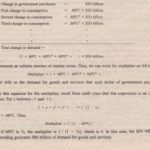 There are two macroeconomic effects that make the size of the shift in aggregate demand differ from the change in government purchases. 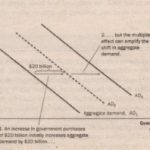 The first-the multiplier effect suggests that the shift in aggregate demand could be larger than $20 billion. The second-the crowding out effect-suggests that the shift in aggregate demand could be smaller than $20 billion. We now discuss each of these effects in turn.